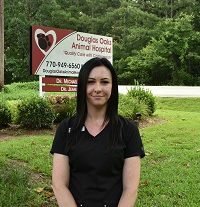 Lesley was born and raised in Atlanta and has been around animals since childhood. She has worked in the horse industry for 10 years and has always held a soft spot for cats. In her free time, Lesley enjoys spending time with her two cats, Zelda and Jiggers. She also enjoys being in the garage with her husband, Ben, working on cars.